Mojitos are the perfect drink for summer herb lovers. All you need is fresh mint leaves, lime, sugar and club soda. A jigger or two of white rum is optional. Don't worry following this recipe in exact proportions, in fact have fun and play with different combinations of mint cultivars and citrus fruit. Adjust sugar to taste, or substitute stevia to make a calorie free refresher. Cut a lime in half and then slice it into quarters. Place a small handful of mint leaves in the bottom of a sturdy glass jar with 1 lime wedge. 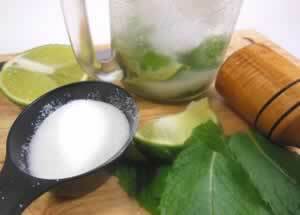 Use a muddler or pestle to crush the mint and lime together. Add a few more lime wedges and the sugar and muddle again. Fill the glass almost full of ice and pour in the rum. Fill the glass with club soda and garnish with the last lime wedge. Stir to bring up the sugar, but don't strain. The ice with hold the mint leaves down in the bottom of the glass.